One morning last week, Peter woke up and went to the kitchen. When he came back to my room, he was holding a bananas. 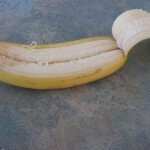 When I looked at it, it looked like two bananas; then when I looked at it again, it looked like one. Was I seeing double after just waking up? 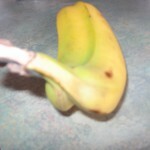 After I took pictures, I opened the banana for Peter to eat. 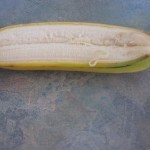 Inside we found a regular size banana and a smaller bananas in one really big peel! 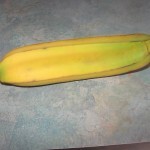 So, he did what any nice 6YO boy would do and gave his brother the smaller banana! 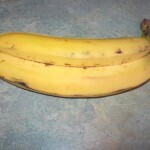 This entry was posted in Kids, pictures/video on February 24, 2009 by Tabetha Gedeon.